Hey, Joy, you are an idiot, there is no limit to how many pardons a POTUS can make. Remember when Jimmy Carter pardoned all of the Vietnam draft dodgers? That was about 100 thousand pardons in one fell swoop. Of course, President Trump didn’t say he would pardon Mahafort or anyone else, he said that he hasn’t taken anything off the table. That’s a distinction Behar can’t negotiate considering her IQ is about half that of a goldfish. The thing that makes me most angry is the idea that Paul Manafort could possibly be pardoned. If he is pardoned, I don’t know what I’m going to do on this show. Behar scoffed at the notion that Trump’s former campaign manager would receive a pardon, noting, “I think he has to save the pardons for his children, frankly. … There’s a lot of kids in the family.” But Joy he has less than 100K kids. Clearly, the far-left, if unenlightened, Behar was going for a joke to pander to the show’s left-leaning viewers, but there may be some basis in fact for her quip. In an exclusive interview with The Political Insider earlier this week, former adviser to President Trump and Republican operative Roger Stone said he believes Donald Trump, Jr. “could be targeted” for indictment. Stone gave two reasons for his presumption, one which could actually land either Trump Jr. or Eric Trump in hot water. 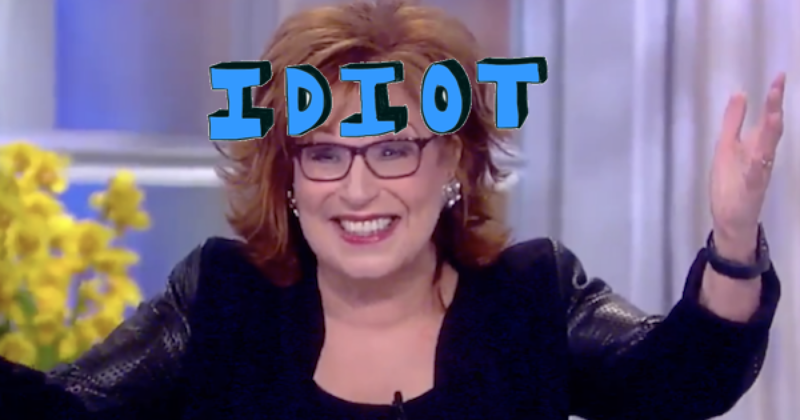 Whether they are indicted in the witch hunt or not, it won’t help Joy Behar. She will always have the mental capacity of a rock.